Helping you find the Best Vacuum Cleaner for your Home! 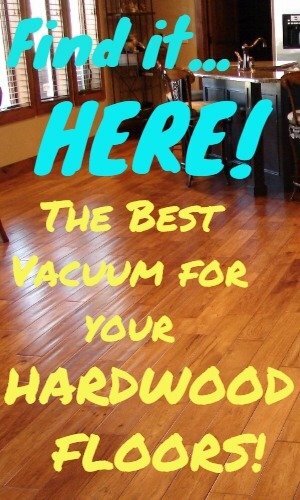 When you vacuum as often as I do you want the Best Vacuum for Allergies you can get your hands on! 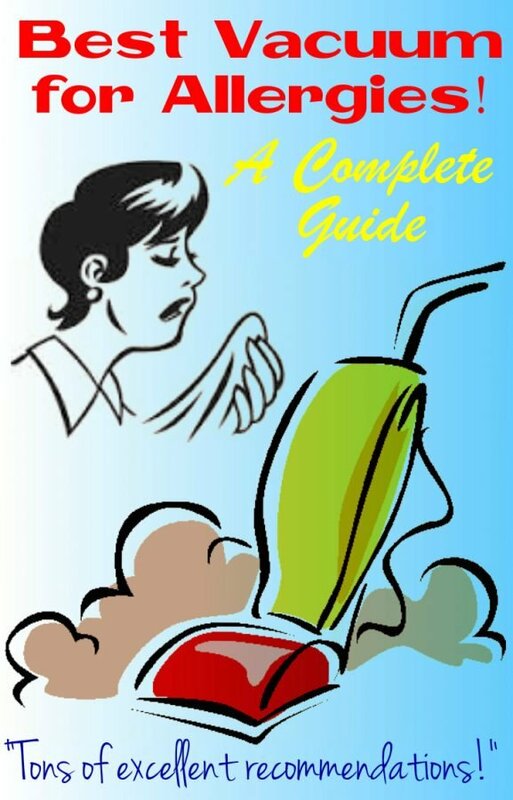 A vacuum cleaner with a highly effective filtration system can make a world of difference for your Allergies, Asthma, Hay Fever (allergic rhinitis) or COPD. 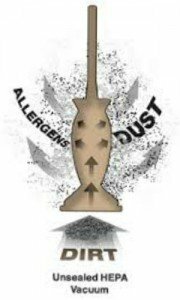 If your vacuum cleaner doesn’t have an adequately designed filtration system, it can fill the air with every imaginable allergy-causing pollutant you are trying to avoid. As a Carpet Cleaning Technician with IICRC Certification (Recently Retired) the very first step of a professional carpet cleaning is to do a thorough vacuuming job. The last thing I want to do is trigger my customer’s allergies. But trust me when I tell ya I don’t want to breathe those nasty allergy-causing villains found in every carpet. And not just carpet – pollen, mold, human and pet dander, dust mites that feed on it and their feces all end up on your smooth and hardwood floors also. Yuck! Avoiding allergy triggers is a year around battle. Spring, Summer, Fall, or Winter – Mother Nature is always throwing something at us that can activate your allergy. What TYPE of Vacuum for is Best for Allergies? Excellent Filtration is Imperative for Allergy Suffers! Does HEPA Filtration Determine the Best Vacuum for Allergies? What is a Sealed Vacuum System and Why is it Important? How Important is Allergy-Friendly Certification? The best type of vacuum to help you fight that battle depends on what type of floors and other areas you will be cleaning. There are Upright and Canister vacuums that are either Bagged or Bagless dirt-capturing system. Each one has advantages and disadvantages. Your job is to decide which type best fits your home environment. 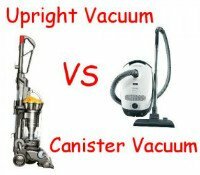 Which is Best, an UPRIGHT or CANISTER Vacuum? Type 1) If your home has mostly medium to heavy pile wall-to-wall carpet I recommend that you go with an UPRIGHT Vacuum. Type 2) If your home has low-pile carpeting, area rugs, and/or hard floor surfaces I recommend a CANISTER Vacuum. If you home has medium to high pile carpet there are canister models equipped with a motor-powered floor brush. This feature is absolutely necessary to deep clean medium to high pile carpet. The downside is that it can add significantly to the cost. 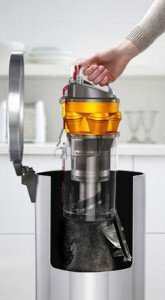 Should I Choose, a BAGGED or BAGLESS Vacuum? more convenient because you simply detach the Canister (Dirt Bin) with the press of a button and with the press of another button you dump the contents, and then return the Canister to the machine. Some of the Best Bagless Vacuum Cleaners for Allergies do an incredible job of removing allergy-causing particulates. In fact, they are as effective as a high quality Bagged Vacuum. These vacuums are equipped with large HEPA-Level Filters that arrest 99.9% of dangerous allergens. The only problem with a Bagless Vacuum is when you empty the dirt cup. It is almost impossible to dump the contents of the dirt cup without causing at least a slight dust cloud. It’s a good idea to take the dirt cup or canister outdoors if possible to empty. seal the bag when removing. 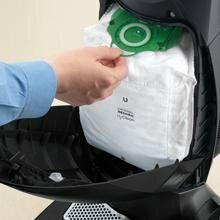 This eliminates all but the most minute puff of dust when removing the bag once it is full. The best-rated Allergy-Friendly Bagged Vacuum models utilize HEPA Rated Bags that will remove up to 99.9% of allergy-causing particulates. Plus a second stage HEPA Filter to catch any micro particulates that leak around the bag seal or through the bag material (media). 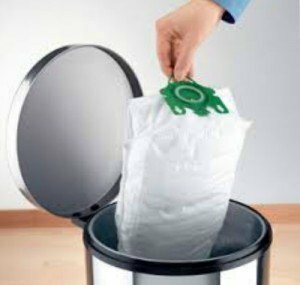 The main problem with Bagged vacuum cleaners is that once the bag becomes approximately half full the suction power begins to drop. That’s why it’s important to monitor the dirt level. Some of the top brands feature a Bag-Full Indicator to prevent overfilling. Bagless vacuums are slightly more convenient to operate and less expensive than bagged types. Not having to purchase bags saves you money. 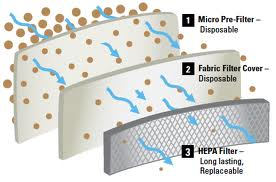 Also, the HEPA filters are usually cleanable which also saves money. The downside is you have to deal with transferring your dirt from one receptacle to another. This procedure assures that some amount of fine dust will escape during the process. Bagged vacuums are slightly less convenient to operate and more expensive. That’s because the bags are made of a HEPA-Level material and can be somewhat expensive, especially if you have to vacuum often. You do have to change bags when it becomes full, but you eliminate the possibility of dust escaping in the process. The bottom line is that Bagged vacuums are more hygienic than Bagless. If your home has a lot of wall-to-wall carpeting and perhaps Vinyl, tile, or wood flooring in the kitchen area an Upright Vacuum is your best choice. A model equipped with a removable wand and extension hose gives you more cleaning options. This will give you the versatility you need to be able to deep clean your carpet and your smooth hard floors, plus the ability to clean above-floor areas. Below I have listed both Bagless and Bagged Uprights. Each one delivers excellent cleaning performance as well as trapping dangerous allergens. Certified Asthma and Allergy Friendly as well as modestly priced, the new Dyson Ball Multi Floor 2 Upright is a masterpiece of vacuum cleaner technology. The slender design and ball steering gives you excellent maneuverability in tight places. As the name implies, the Dyson Ball Multi Floor 2 gives optimal performance on Carpet, Vinyl, Laminate, Tile and Hardwood flooring. The vacuum head adjusts automatically to give maximum suction throughout the entire house. The powerful brushroll easily removes pet hair from carpet. When it comes to cleaning above floors the Wand and Hose assembly release effortlessly and extends a whopping 15 feet. That’s long enough to reach and clean the highest ceiling fans, molding, and blinds or under and behind furniture. A feature that is so important for allergy suffers is the Hygienic Dirt Bin Emptying System making it unnecessary to touch the dirt. Whole-Machine HEPA-level Filtration traps 99.9% of mold, pollen, dust mites, dust mite feces, bacteria and other allergens so they don’t get blown back into the air you breathe. Check Out this Cool Demo VIDEO! Dyson’s 5 Year Warranty that covers parts & labor, plus free shipping there and back. The NEW Dyson Ball Multi Floor 2 Upright Vacuum is as good as it gets when it comes to Bagless Vacuums for Allergy Sufferers – and the price won’t scare you! Quick Tip: Be Considerate! Wait till the kids are away to vacuum, they are closer to the floor where all the dirt is. You don’t have to spend $500 and up to get one of the Best Vacuums for Allergies! The Shark Navigator (NV356E) is one of the best Bagless Upright allergy-friendly vacuums available because it has an extremely effective Sealed Vacuum System plus excellent HEPA Filtration. In fact it is so effective that when measured for leakage using a hand-held Laser Particle Scanner it only detected a few particles less than .3 microns which is very very small. Whereas the Dyson DC41 Animal which also had minimal leakage but larger particles at .5 microns. I know it doesn’t seem like much but to an allergy sufferer it can make the difference in an allergic response and no or minimal response. Shark Navigator Vacuums are recommended by the British Allergy Foundation. It is powerful, very versatile, a pleasure to operate, and very budget-friendly. It is backed with a huge 5 Year Warranty! I have probably recommended Shark Navigator Vacuums more than any other Bagless Upright. I recommend this vacuum to my Sister a few years ago because she has some health issues and she just loves it! The Shark Navigator Lift-Away vacuum models are some of the Best moderately priced Upright Vacuums for Allergies and certainly one of the Best Whole-House Vacuums available. You won’t be disappointed! Quick Tip – Go Outdoors! Take your vacuum cleaner Outdoors to empty the canister or change bags to eliminate any dust from escaping back into your house. The Prolux 7000 Bagged Upright Vacuum is highly recognized in health-related institutions for being able to stand up to everyday commercial use and is an excellent vacuum for allergy suffers. The powerful Amtek motor is the best in the industry. It has the ability to deep clean your carpet and remove the offending allergens. It has a steel brushroll and a steel vacuum head grate for long life. The Prolux 7000 features a Sealed Vacuum System with a Hospital Grade HEPA Filter to trap the most minute allergy-causing particulates without leakage. Prolux is made by Aerus, LLC of Bristol, Virginia, USA, the same company that makes the familiar line of Electrolux Vacuums. You have to see and opperate this fine Upright Bagged Vacuum to appreciate the quality. That is why it is backed by a HUGE 7 Year Warranty! My only criticisms are, its a bit heavy at 17 pounds and it doesn’t have swivel steering making it less handy at getting in to tight places. The Prolux 7000 is a High-End Bagged Vacuum with a Low-End Price tag! Similar quality Germany-Made vacuums cost more than twice the price but with no better performance! This is one fine vacuum and deserves a close look! Be sure and take note of the High Customer Review Ratings! When it comes to vacuum cleaners the name Miele has become synonymous with high quality and their Bagged Uprights are arguably the most Allergy-Friendly available! Just as important, Miele designs their AirClean Filter Bags with a Quick Close Flap that virtually seals the bag the instant you remove it so the allergens you just vacuumed from your floor don’t escape back into the air. Meile U1 Series vacuums feature Swivel Steering technology that makes maneuvering around the floor almost effortless. Automatic Height Adjustment allows you to transition from smooth to carpeted floors without stopping. Variable Suction Control located near the handle so you can select the optimal power for the surface you’re cleaning. An extra-long 39 Foot Power Cord for large rooms minimizes changing receptacles. Unlike most upright vacuums, Meile U1 Series vacuums utilize 2 motors instead of just one. One motor produces 1,200 Watts of suction power and the other motor powers the floor brush for deep cleaning heavily used carpets. Backed by an industry-leading 7 Year Warranty, Miele vacuums are tested to last up to 20 years of average use. Oh, and did I mention, this vacuum is very QUIET! If you suffer with allergies and appreciate high quality and elegance of German engineering, you owe it to yourself to explore the Miele 41HAE032USA Dynamic U1 Maverick! A good quality Canister vacuum with HEPA Filtration is your best choice if your home has mostly smooth or hardwood floors, with some area rugs and, perhaps, some low to medium pile carpet. Most canister vacuums don’t come equipped with a motor-powered brushroll in the vacuum head. They utilize a detachable floor brush with bristles which is very effective on hard and smooth floors. It will also work just fine for short pile car pet as well as your area rugs. person who demands uncompromised quality and wants the ultimate in Allergy relief while vacuuming. At a time when companies are looking for ways to increase their bottom line by cutting costs, Miele has taken the opposite path. Its European/German quality become obvious the instant you remove the Miele Complete C3 Marin from its box. Careful thought went into the design and engineering of the C3. From the Variable Speed Six Stage Motor to the Clean Seal HEPA Filtration System this vacuum is equipped to meet all of your cleaning and respiratory safety needs. traps 99.9% of dangerous allergens as tiny as 0.3 microns. And when it’s time to empty the large capacity AirClean 3D Efficiency Dust Bag, simply close and seal in the dirt with the QuickSeal Flap. 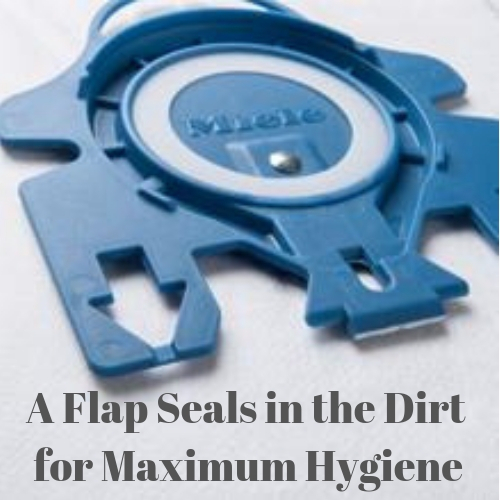 A plastic Flap is molded on to the bag that allows you to close and seal the port without any dust escaping into the air. Your fingers never come in contact with the dirt. This system gives you the maximum hygienic dirt removal system available. When it comes to cleaning performance the Miele Complete C3 will deep clean any carpet with the SEB236 Electro Premium Electro brush. Designed with a motorized brushroll, it has the power do dig out even the toughest dirt and hair from carpet pile. By simply tapping the foot pedal switch you can adjust the suction for cleaning Soft Plush Carpet. A bank of LED Headlamps floods the cleaning area with light so you can see where the dirt is at. Snap on the SBB300-3 Parquet Twister hard floor brush and easily and effectively clean your hardwood and smooth floors. Or, click on the Dusting Brush or Upholstery Tool and address those above-floor areas that require regular cleaning. Watch this Amazing Demo VIDEO! Miele canister vacuums are tested to last up to 20 years with average use. The elegant Miele Complete C3 Marin represents an investment in your health with uncompromised cleaning performance. This high quality canister vacuum has earned the coveted Good Housekeeping Award which give you additional piece of mind. 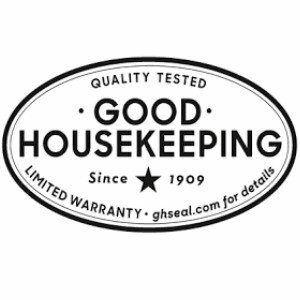 Miele owners are protected by a huge 7 Year Warranty on Motor/s and Casings, w/ 1 year on Parts & Labor plus an additional second year covered by Good Housekeeping. Yes, the factory warranty is valid when purchased on Amazon. Just be sure and register it. If you are want a solution to your respiratory concerns, the Miele Complete C3 Marin is the best bagged canister vacuum currently available for allergies! 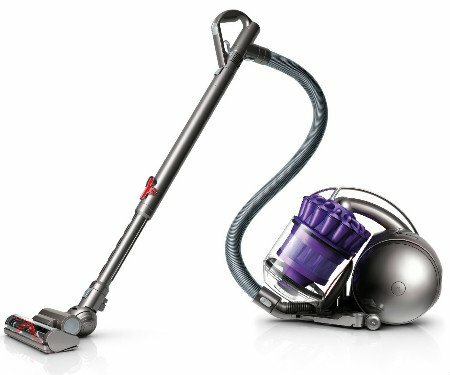 The Dyson DC39 Animal is probably the best Bagless Canister vacuum available and it features the Asthma and Allergy Friendly™ Certification Dyson has become famous for. This Dyson utilizes a HEPA Filter as an added step in removing the last traces of micro particulates that are not captured in the cyclonic dirt canister. The DC39 is Certified by the Asthma and Allergy Foundation of America. It has a turbine powered brush roll which gobbles up pet hair from carpet. As with all Dyson Vacuums it is backed by a 5 Year Warranty! Quick Tip – Read the Operator’s Manual! Most negative customer reviews are a result of new owners not taking the time to familiarize themselves with their new vacuum. A few minutes spent reading the owner’s manual will help you get the maximum performance from your vacuum and possibly save you some headaches. When you think about it a vacuum cleaner is actually an air processing machine. Each one has a motor-powered fan that creates a negative atmosphere (Vacuum or suction) within a system of chambers and tunnels. Its purpose is to lift dirt, debris, and micro-sized particulates from the floor and transport it to a repository such as a bag or canister. That’s Good! The Negative air pressure apparatus of the system is called a Nozzle or Vacuum Head. The Positive air pressure end is called the Exhaust Port. Between the two there is either a bag or a canister designed to capture as much dirt as possible before exhausting the air back into the room. Gravity provides enough force to cause the heavier dirt and debris to fall into the repository. But without some type of filtration media such as a bag or filter, the finer lighter dirt particles that contain the allergens just get blown out the exhaust port and into the air you breathe. Not So Good! Almost every vacuum cleaner model is equipped with some type of filter to limit the dirty air that escapes. Economy models usually have washable sponge filters that work OK to capture the larger particulates, but not good enough if you suffer with repository issues. The answer is NO, not necessarily! “passes through it.” A HEPA Filter is made up of layers of media designed to capture fine particulates as tiny as .5 to .3 microns. 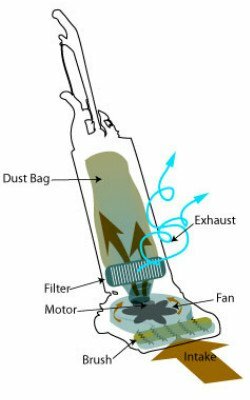 The problem is, with most vacuums a significant percentage of the exhaust air leaks through openings along the vacuum exhaust system. This is especially true with budget and some moderately priced machines. A vacuum model equipped with a HEPA-Level filter is of little value if its exhaust air is leaking around the filter. If you want the Best Vacuum for Allergies it is absolutely necessary to select a vacuum with a Sealed Vacuum System. It’s vitally important to select a vacuum cleaner with a sealed filtration system. This will prevent the dangerous allergens you are trying to avoid from escaping back into the air you breathe. The Best Vacuum Cleaners for Allergies will incorporate a gasketing system between the Dirt Canister of a Bagless Vacuum and the HEPA Filter Compartment. Or in a Bagged Vacuum, between the Bag and the HEPA Filter compartment. This will prevent leakage of contaminated emissions. All types of vacuums currently being produced are available with Closed System HEPA Filtration including Upright, Canister, Handheld, and Cordless Models. A Sealed Filtration System is a no-compromise feature you should insist of if you want the best vacuum for your allergies. Allergy Support Groups such as the Asthma and Allergy Foundation of America and the British Allergy Foundation provide so many valuable resources for Allergy Suffers. They deserve our gratitude for the improved quality of life made possible by what we are able to learn from them. Unfortunately, these organizations have limited resources so they are not able to test every vacuum model that comes on the market. They only test the ones submitted for certification testing by their manufactures. These companies seek the improved marketing status by obtaining certification. They already know if the the model they submit will meet the stringent criteria. Then its a matter of paying the testing fee to be able to place that coveted sticker on their product. So, just because a vacuum cleaner does not have a certification sticker on it does not mean that it’s not one of the best vacuums for allergies. Keep in mind, these foundations ONLY test a vacuum cleaner’s EMISSIONS! They DO NOT test the vacuum for power, convenience of use, effectiveness, or over-all quality. That is the purpose of this GUIDE! So, just because a vacuum listing DOES NOT display an Allergy Friendly Sticker doesn’t mean it isn’t Allergy-Friendly. Likewise, just because a vacuum DOES display an Allergy Friendly Sticker doesn’t mean it is the Best Vacuum for Allergies. Quick Tip – Timing! Avoid vacuuming just before bed time. Even the best HEPA vacuums stir up some dust. Give it time to settle. So much to consider! I have COPD and a dog. Only one room has thick carpet with soft fibers, rest is hardwood. I need the best of the best….was looking to buy a Meile complete C Marin canister ? But ? Help!. Hi Nancy, and thanks for your question. I’m truly sorry to learn that you suffer with COPD. I can only imagine how miserable it must be for you. But take heart; there is a vacuum cleaner model that is designed to meet all your needs. I totally agree that you need a vacuum with the best filtration and dirt disposal system possible. If you read my article (Above) then you have learned that there is more to an effective filtration system than just having a HEPA filter. The filter must be housed in a Sealed System to eliminate any leakage of polluted air from leaking around the filter. Also, especially since you have a dog that sheds hair and pet dander, you need to go with a BAGGED vacuum instead of a Bagless. The reason for that is you don’t want any dust you just vacuumed from your floors escaping back into the air you breathe every time you empty a dirt cup. A vacuum with a motorized floor brush is absolutely necessary to deep clean carpet, especially Soft Ultra Plush. 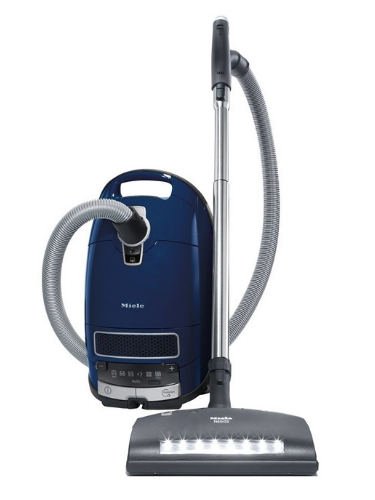 The Miele Complete C3 Marin is an excellent canister vacuum. However, it is not designed to clean Soft Ultra Plush Carpet. A better choice would be the Miele Complete C3 for Soft Carpet which is designed especially for Ultra Plush Carpet (SEE: Best Vacuum for Soft Plush Carpet) and has all the features necessary to work great for dealing with pet hair on both hardwood floors and carpet. It is equipped with a HEPA Level Filter plus Miele’s proprietary AirClean Sealed System Bags which incorporate a plastic flap molded right to the bag. This allows you to completely Seal the bag once it is full without a puff of dust escaping. This reduces the chance of any dust escaping to an absolute minimum. I believe you will find the Miele Complete C3 for Soft Carpet to be a real blessing in your battle with COPD. These machines are expensive but they are the Mercedes Benz of vacuum cleaners. The good news is they last for many years so you won’t have to deal with replacing it for a long time if you take care of it. Copyright © 2019 Best Vacuum Cleaner Info. All Rights Reserved. Read about our cookie usage and privacy policies HERE. As an Amazon Associate I earn from qualifying purchases.